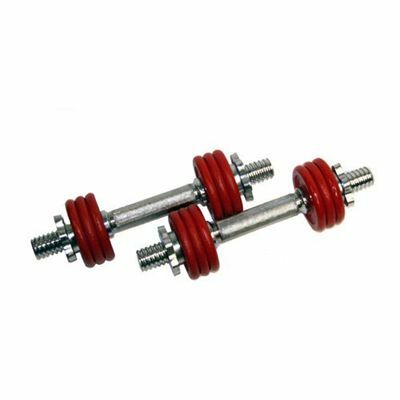 The DKN 2 x 5kg Red Cast Iron Champion dumbbells are a standard width pair of Chrome Champion dumbbell bars. They come with a series of Red Cast Iron Champion weight plates, and spin lock collars at each end to ensure a perfect fit and no movement when in use. This means you can adjust the weight to the desired level quickly, easily and securely. for submitting product information about DKN 2 x 5kg Red Cast Iron Champion Dumbbells We aim to answer all questions within 2-3 days. for submitting product information about DKN 2 x 5kg Red Cast Iron Champion Dumbbells. We aim to answer all questions within 2-3 days. If you provided your name and email address, we will email you as soon as the answer is published. for submitting product review about DKN 2 x 5kg Red Cast Iron Champion Dumbbells.